If your tarot number is either 19 or 10, your soul is represented by the Magician. Visionary and inspirational, you’re the person people go to for new ideas. You’ve got the uncanny ability to turn your ideas into reality – or at least get others so excited that they do it for you. Focus is a key to your success. If you put your mind to something in a serious way, you’re almost assured that it will become a reality. Communications and clear quick thinking are your gifts. Magic is nothing more than the manipulation of energy to one’s will. At their best, Magician types are positive masters of manipulation. 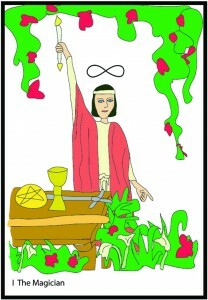 The Magician is the soul symbol for both the Wheel of Fortune and Sun personalities. § 3 Responses to Soul Card #1 – The Magician"
Hello my loved one! I want to say that this article is amazing, nice written and come with approximately all important infos. I’d like to see more posts like this . Clicking on the image should expands it. Then you’ll notice that at the top of the screen there’s an option bar. One of those options is for printing.